What happens at a One Health Clinic? Dedicated volunteers deliver preventative animal health care such as physical exams, vaccinations, parasite control, and pet health education. We accept clients on a referral basis from community partnerships that include area shelters, municipal public health, community health centres, and mental health organizations. Referral by a case worker (affiliated with an agency partnered with Community Vet Outreach that works with homeless or vulnerably housed populations). No veterinary relationship with a clinic or vet within the last 12 months. Exceptions may include emergencies or spay/neuter. This helps us reach our target population of pet owners experiencing homelessness, that are street-involved, or vulnerably-housed. An appointment at a clinic is arranged by referral from a case worker at an agency partner. 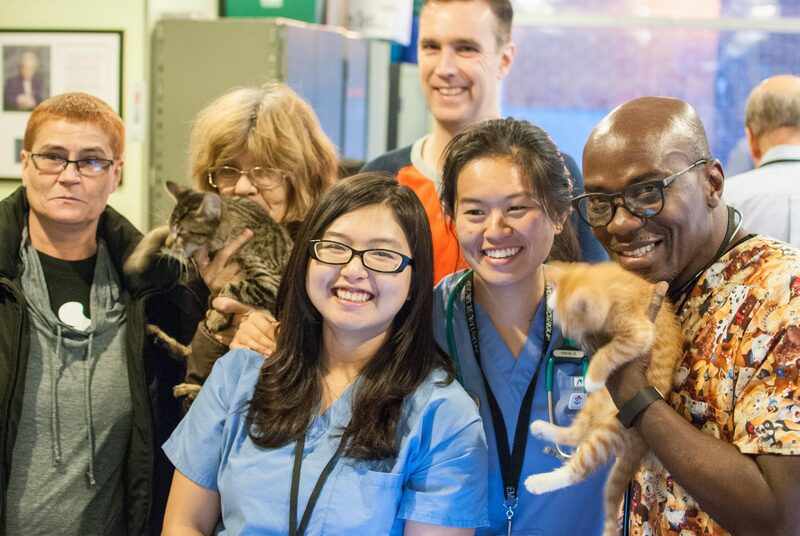 What happens at our One Health “Pet Fair for People Care”? Our pet fairs provide animal-related services such as pet health education and home care, nail trims, grooming, and microchip placement, as well as pet food and supplies. Pet fairs allow us to operate in smaller spaces in more neighbourhoods, have more events, and continue to focus on clients associated with our partner agencies. All clinics and pet fairs have social and various health services imbedded within them, depending on the partnerships in the region. These services include smoking reduction and cessation, primary health care including flu vaccination, dental care access, harm reduction (naloxone kits, safe injection supplies), and healthy living/ exercise advice. CVO’s One Health model is the collaboration between human and animal health partners, with an understanding that the health of humans and animals and the environment (social and physical) are interconnected. All our programs have social and human health services embedded within them. We have collaborative partnerships with mental health, public health, and community health agencies and health programs at academic institutions. Human health services are present at all One Health Clinics and Pet Fairs. Services include smoking reduction and cessation, primary health care including flu vaccination, dental care access, harm reduction (naloxone kits, safe injection supplies), and healthy living/ exercise advice.